The journey of Dan Harmon’s quirky, nerdy sitcom Community has been a long and tumultuous one. After five bumpy seasons on NBC, the show was cancelled and fan dreams of #SixSeasonsandaMovie appeared dashed. But not long after, the property was picked up by Yahoo!, and a sixth, online-exclusive 13-episode season was announced. The sixth season is currently in progress, airing a new episode every Tuesday, and so far the show has been entertaining and refreshingly self-aware about its difference from the original NBC run. Though several members of the original cast are no longer with Greendale, we’ve been gifted two new regulars, Elroy Patashnik (Keith David) and Francesca “Frankie” Dart (Paget Brewster). In the season’s first episode, “Ladders” (written by creator Dan Harmon and Chris McKenna) Frankie is hired as a consultant to improve Greendale, and her perspective on the ridiculous antics that take place at the school serve as the perfect grounding point for the “new” Community. The unifying goal for the group is no longer taking classes, or maintaining their unique group dynamic, because both of these goals have been prematurely negated; Troy and Shirley have left the school for other pursuits, Pierce has died, and the cast is no longer a “study group” but a kind of student-faculty council for the school’s affairs and public image. The show’s trademark humor is still very much at play, as are the often absurd scenarios the main characters find themselves in. In the second episode, Chang gets bit by a cat after insisting that he has a way with them and wanders around in an infected stupor telling everyone about the bite and showing them his hand, which swells in size every time we see it. 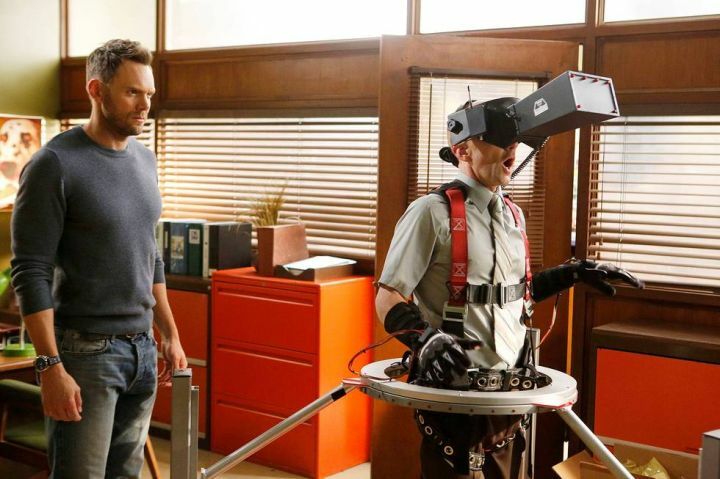 In the same episode, Dean Pelton becomes obsessed with an incredibly low-tech virtual reality machine and imagines himself a digital god. 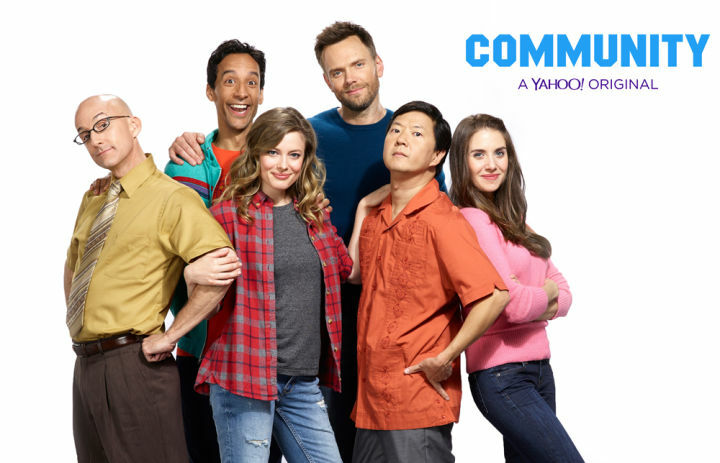 But what is perhaps most interesting about the sixth season of Community has nothing to do with the actual content of the show, and everything to do with the way it has made its way to our screens. Last year, when Community was finally cancelled by NBC, I wrote a research paper about the show’s cult status and what was thought at the time to be its final chapter*. At the time, Community had been through several threats of cancellation, saved by social media campaigns and a highly motivated fanbase. The cancellation by NBC after season five appeared to be the last nail in the coffin after two seasons of death throes. But now, Community has turned some of my previous conclusions on their heads and proven it’s not down for the count just yet. The show has followed in the footsteps of shows like Arrested Development, which had a fourth season aired exclusively on Netflix years after it was cancelled, and Twin Peaks, which is set to return as a limited series on Showtime in 2016. With Yahoo! at the helm, is it possible that Community will actually fulfill its unofficial slogan of “Six Seasons and a Movie”? What does this trend of cancelled television shows finding new life on the internet mean for the future of network television, web content, and authorship? A consistent sense of authorship certainly seems to be an essential element of making the successful transition from television to internet. Part of what makes Community’s sixth season feel natural and authentic is the presence of the show’s creator Dan Harmon as executive producer. Even with all its production hiccups and the major changes to the cast, season six still basically feels like the Community its fans fell in love with, the one inspired by Harmon’s real life experience making unlikely friends while in a study group at Glendale Community College. The showrunner’s notable absence in season four is one of the show’s established low points, and the success of season six will likely depend on whether or not the show can avoid the mistakes of season four and retain the je ne sais quoi Harmon brings to the table. Whatever happens, it will be interesting to observe how well Community fares as “A Yahoo! Original,” if the show is in fact developed into a movie in the future, and what its success or failure means for other beloved cancelled shows (like, dare I say, Firefly?) and growing online media companies like Netflix, Hulu, Amazon, and now, Yahoo! Screen. *You can read this paper here, using the password sixseasonsandamovie.